Boomerang is a leading supplier of packaging products in Houston, offering a complete line of plastic strapping tools from the top manufacturers in the industry. We are committed to providing each customer with an effective solution to their packaging needs using the highest quality in packaging supplies and materials, coupled with superior customer service. Boomerang’s line of strapping products is manufactured by the top manufacturers in the industry. Our staff works with each client to select the strapping system and products that will ensure that their products are protected and will be safe during shipping and storage. 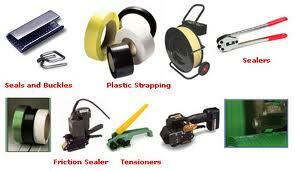 Our line of strapping and strapping equipment includes the following. Manual Combination Tools – Manual combination tools allow for complete strapping operation – tensioning, sealing and cutting – with a single tool. We offer Signode strapping tools that can handle 1/2” Contrax polypropylene, 1/2” Tenax polyester and 5/8” high strength Tenax polyester. Manual Tensioners and Sealers – Used for lower volume operations or operations that do not have access to a power supply, hand tensioners and sealers provide effective strapping. We carry Signode’s line of hand tensioners and sealers. We offer walking gripper, feedwheel and windlass tensioners. Our sealer models include front and side action tools. Battery-powered Tensioners and Sealers – Battery-powered hand tools provide more efficient operation for low to medium volume packaging. These tools are easier to use, faster and provide more uniform strapping tension than manual hand tools. Boomerang carries the Signode brand of battery-operated tensioners and sealers. Pneumatic Tensioners and Sealers – Pneumatic hand tools offer efficient strapping application by providing one-button operation and faster strapping than manual tools. They also provide precise, uniform tension in the strapping. We offer the full line of Signode pneumatic hand tensioners and sealers. Boomerang Packaging is committed to providing every customer with the most effective packaging supplies for their application. Each customer is served with total commitment and excellent customer service, whether they are an international company, or small, local manufacturer. Our product line represents the top manufacturers in the industry, so that you know you are buying the best from us. And, we stand behind our products. If they don’t perform the way we tell you they will, we’ll replace them or refund your money, no questions asked. It’s all in our name – we work hard for you, so that you keep coming back – Boomerang!